Google Calendar is a online calendar service which allows you to add various tasks and events and keep your time-management information on the cloud. Because it's online service, the information added to the calendar can be accessed from anywhere using your Google account. 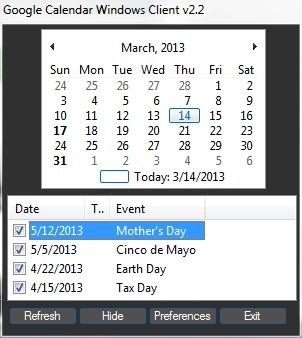 Google Calendar Client is a portable Google Desktop Calendar for Windows that can retrieve events from your multiple Google Calendars, and display them in a small sortable list on the user's desktop. This simple Google Calendar desktop application can automatically synchronize with any Google Calendar, even more accounts at one time, and can display all the tasks and events using a small on-screen calendar. Once Google Calendar Desktop Client retrieve the information on the Google Calendar, you can quickly see what events will come up next without having to launch the web browser and browse to the Google Calendar website. Google Calendar desktop client saves your calendar data in memory to enable you to view your calendar without an internet connection until you want to refresh the data. Other features include popup reminders, and the ability to export individual events to Microsoft Outlook or to any vCalendar compliant application. Google Calendar Desktop Client file size 1.9MB.